Trade-in rebates of $13 per 2 GB module from Apple can also be applied. 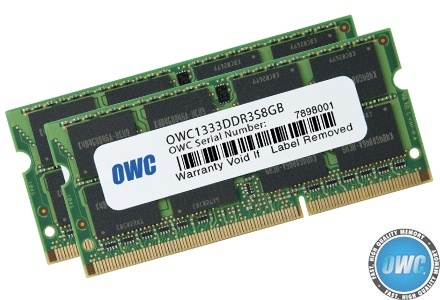 OWC maintains a "MaxRAM" testing lab of Apple machines and has verified that the new MacBook Pros can accept up to 16 GB of RAM. I do not understand why anybody would want to have 16 Gb RAM. I have 16 Gb and it is utterly useless. Never ever have I seen my rMBP use more than 6-7 Gb. And that is using FCX and compressor and Parallels and Safari and Excel and Word at the same time. Buy 8 Gb and use the money you save for something nice. And 16 Gb does slow wake-up from deep sleep by 4 seconds or so in comparison with 8 Gb. Not everybody does as little with their machine as you do. So give me an example of people doing more. What tool or combination of tools actually runs slow because there is only 8 Gb? 1. VMware + GNS3 to simulate an 2 active directory sites, with a WAN between them - is my personal use case where the more ram the better. 2. Alternatively, simulating trust relationships between AD domains, development lab for Exchange upgrades, etc. There are plenty of uses for 16gb of RAM or more, if i had 32GB in my laptop i could certainly make use of it. I'm constantly hitting the limitations of 8GB at the moment at work and am likely to pop 16GB in my home machine (the MBP below) shortly so I can get things done at home instead. Having a heap of RAM in my personal laptop means I can simulate a hell of a lot of stuff without needing to build a test lab. Why would anyone pay these ridiculous prices for memory when you go get the same memory from Crucial.com? I bought the 16GB kit from Crucial for my mid-2012 MacBook Pro for $75 and that was including shipping!!! Crucial has Mac specific memory, even though it really doesnt matter as long as you get the same type such as DDR2 or DDR3. although it is amazing how much the pricing has dropped.. But who needs 16Gb? And I speak from experience. My rMBP has 16 Gb and it NEVER uses more than 7GB and that is doing heavy duty video-editing and rendering and audio-editing at the same time. It will be years before 16Gb is essential. Save the money now and from that money get a new computer in 2-3 years. And 16Gb slows wake-up time from deep sleep by about 4 secs in comparison of 8 Gb. I need 16GB. I support Windows and Macs in a domain environment. I can't very well be asking people 'please hang on while I reboot into Windows' or vise-versa, so I run them side-by-side with VMWare Fusion. With stock 8GB I was able to give 4GB to each OS but that's a pretty small amount by today's standards (and considering I'm currently running 13 management-type programs just in Windows), so I upgraded to 16GB total and gave 8GB to each. The difference was night and day. Lol, no. Their prices are miserable, I can go to a BRICK AND MORTAR store, ie Microcenter or Fry's and get an 8GB stick for 30 bucks. (Check out Microcenter's store, seriously) 16GB kit for 60, and it is right down the street. OWC is the biggest ripoff on the planet for HDD upgrades, and is no bargain with RAM, but people around here seem to praise them to no end. Oh, well. Are you joking? When you use Photoshop and Illustrator with 16gb of RAM Photoshop alone will use over 10gb of the RAM by default. My wife uses both at the same time, alone with about 7 other programs. You know how much ram is free after that for cache, etc? 2gb. You can't tell me $58.00 for 16gb of RAM is a wasted amount of money. If you are hurting for $58 you wouldn't have an Apple product in the first place. Just because you don't use 16gb of RAM, you have no idea what people who run Final Cut Pro, Pro Tools, and Adobe products need. No offense but you shouldn't speak for everyone who has a computer. LOL...Edit, I just noticed you have a retina macbook, and you're complaining about spending $58 on RAM? Great! Now let's bring on that 17" rMBP with 4 DIMM slots. That's exactly it. The use for 16 gigs of RAM, or two 6 core CPU's in a Mac Pro, or a retina display on a laptop, are limited to certain needs. What 95% of people do 99% of the time on their computers could be done with an iPad. It's what 95% of people do 1% of the time, or the other 5% do a little bit more often, that demands a desktop class computer (including laptops these days), faster CPU's, more RAM, etc.) Even some who push technology to the limits STILL check their email, browse facebook, check internet forums, shop online, etc. All things any cellphone from the last 5 years (or more) can do. It's the once in a while, niche, odd, intense situation you need it for. Or, in the case of RAM, simply because the cost (when you do it yourself) is so much minimally more than an 8 gig upgrade. I could squeeze that into 8 gigs depending on what apps I'm running, or spill over into Virtual memory, but, when it's $20 more to go to 16 gigs over 8 gigs, why the heck not? It allows me to do those rare, once in a while tasks like that. Or, heck, just be lazy and leave the VM's running even when I'm not using them. It's easily worth $20. Plus, I've got a 500 gig SSD (well, two 256 gigs in RAID 0), and I use about 120 gigs right now. How silly would it be to have a 128GB SSD, then swap it to a 256GB SSD when that gets full, etc. etc., Why not just get setup with 500 gigs of storage knowing that, down the road, I might use it? Again, the costs of buying it all at once is cheaper than incremental upgrades. For me it's just future proofing. It's around $40 for an 8GB kit (since some MBP models only come with 4GB!) or around $60 for 16GB. When you upgrade it yourself and not through apple (Which I realize is not an option on the rMBP), it's pretty cheap. Why not? I'll likely not use it either, but who knows. It's nice for virtual machines and the like, I rarely use even half even in intense applications, but what's $20 more to max it out? 3-4 years from now there will be faster, better technologies. But, my 3-4 year old (will be) MacBook Pro will still have enough horsepower to do what I want it to do, though not as well as a new machine. But, I certainly can't afford to upgrade every year. So, with 16 gigs of RAM, I'm ready for 3 or 4 or more years down the road when my machine is beginning to feel it's age and I'm not QUITE ready to upgrade. Or, I'll never need it ever. But again, 4 gigs isn't enough, 8 gigs is only $20 less than 16, so why not? Now on a rMBP, I would have left it at 8 gigs, simply because the RAM upgrade cost is just so expensive through Apple. It's not $20 to go from 8GB to 16GB on the rMBP!